Inside three Georgia counties that have struggled to keep their hospitals ― and futures ― alive. 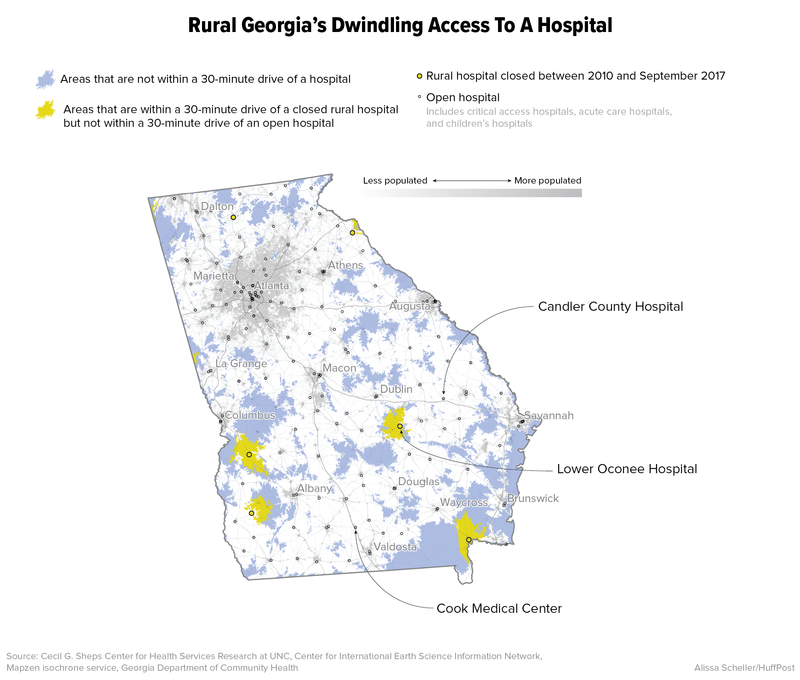 GLENWOOD, Ga. ― If you want to watch a rural community die, kill its hospital. After the Lower Oconee Community Hospital shut down in June 2014, other mainstays of the community followed. The bank and the pharmacy in the small town of Glenwood shuttered. Then the only grocery store in all of Wheeler County closed in the middle of August this year. On Glenwood’s main street, building after building is now for sale, closing, falling apart or infested with weeds growing through the foundation’s cracks. Opportunity has been dying in Wheeler County for the last 20 years. Agriculture was once the primary employer, but the Wheeler Correctional Facility, a privately run prison, is now the biggest source of jobs. With 39 percent of the central Georgia county’s population living in poverty, there aren’t enough patients with good insurance to keep a hospital from losing money. The hospital’s closure eliminated the county’s biggest health care provider and dispatched yet another major employer. Glenwood’s mayor of 34 years, G.M. Joiner, doubts that the town will ever recover. Lower Oconee Community Hospital in Glenwood, Georgia, sits vacant, a reminder of the medical care that was. Rural hospitals are in danger across the country, their closures both a symptom of economic trouble in small-town America and a catalyst for further decline. Since 2010, 82 rural hospitals have closed nationwide. As many as 700 more are at risk of closing within the next 10 years, according to Alan Morgan, the CEO of the National Rural Health Association, a nonprofit professional organization that lobbies on rural health issues. The reasons are complex, woven into the fabric of a changing economy and an evolving health care system. 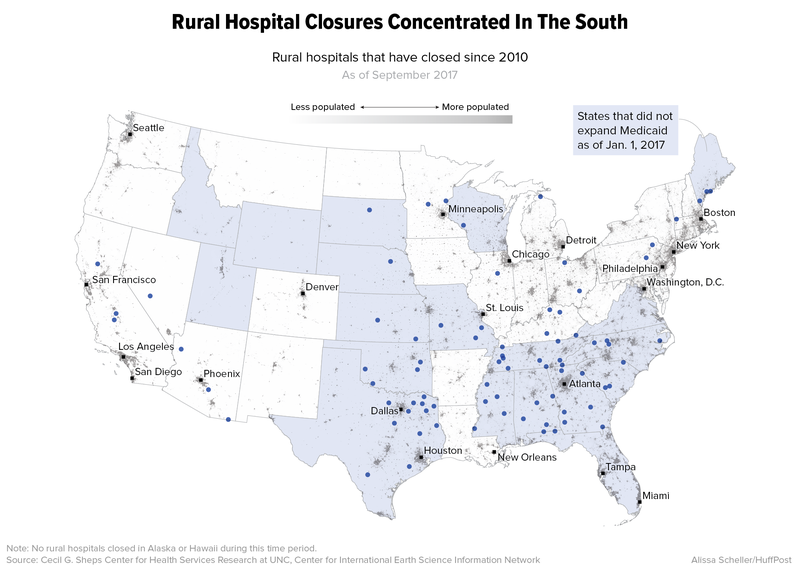 But these rural hospital closures are hitting the southern United States the hardest. One in five adults in the South report having poor health. Fifteen percent of non-elderly residents are uninsured, according to the Kaiser Family Foundation, and that’s 5 percent higher than the rest of the country. 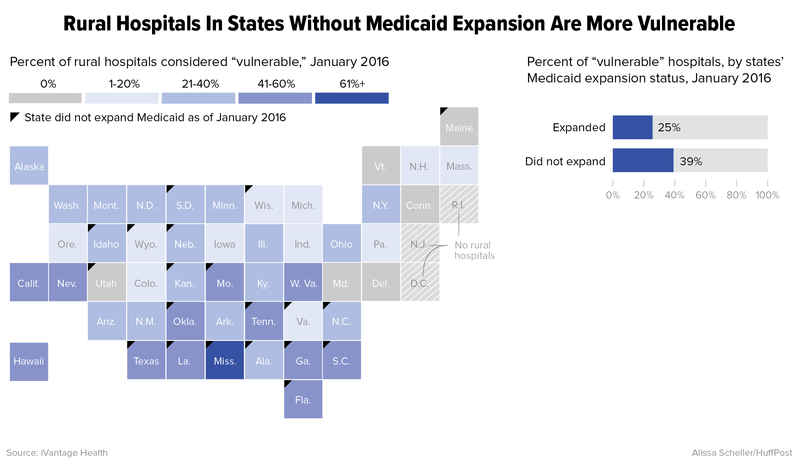 The South also has the largest cluster of states that have not expanded Medicaid under the Affordable Care Act: Alabama, Florida, Georgia, Mississippi, North Carolina, Oklahoma, South Carolina, Tennessee, Texas and Virginia. Georgia is “ground zero” for rural hospital closures, he said. Six rural hospitals in the state have closed their doors since the beginning of 2013. Two of those have been reopened as modified medical facilities, but no longer function as full-fledged hospitals. And more than half of the state’s remaining rural hospitals are vulnerable to closure, according to a 2016 report on rural hospital strength by iVantage Health Analytics for the National Rural Health Association. The troubles with Glenwood’s hospital became apparent about a decade ago. First there were management problems at Lower Oconee Community Hospital as the facility grappled with cash flow difficulties, stemming in part from the county’s uninsured rate of 20 percent. Then the hospital was sold. Then there were more management problems and some failed last-ditch attempts to keep the hospital open, according to Mayor Joiner. It finally closed its doors for good in June 2014. That brought the total number of hospitals in Wheeler County, where some 8,000 people live, to zero. About 120 jobs at the hospital itself ― including positions for doctors, nurses, administrators, orderlies and the cleaning crew ― vanished, along with most of the foot traffic on Glenwood’s main street. Attracting other businesses got that much harder. Most importantly, gone was potentially life-saving care. For three years now, the building has sat vacant, a deteriorating reminder of the community’s loss. The drive to the nearest hospitals in neighboring counties averages between 30 and 45 minutes, depending on where the patient is coming from in Wheeler County. The county’s two ambulances don’t carry blood. And any delay in getting to an emergency room can be deadly for someone who has suffered a heart attack, a stroke or massive trauma. Selena Howell, the director of EMS for Wheeler County, smokes a cigarette outside the Glenwood City Hall and Fire Station. Wheeler County’s director of emergency medical services, Selena Howell, estimates that keeping Lower Oconee Community Hospital open would have made the difference in saving four or five lives over the last three years. “Now that may not seem like a lot, but it sure meant something to those folks’ families,” she said. Howell wearily explained that she herself has been struggling with a kidney infection on and off for the past year, but there are long waits to see a doctor because of the decreasing numbers of physicians and hospitals in the region. The soonest she could get an appointment was months away. Candler County is struggling to make sure its hospital, which is about 45 miles east of Wheeler County, doesn’t go the same way as Glenwood’s. Among rural hospitals, the Georgia Department of Community Health ranks Candler County’s facility as the second-most financially in need. The state’s new rural hospital tax credit program encourages businesses and individuals to donate to these facilities through a 90 percent tax write-off. A series of bad decisions ― especially the installation of a faulty IT system ― combined with the usual factors squeezing rural hospitals have left the Candler County Hospital with about $6 million in accounts payable and an additional $4 million debt that the county incurred on its behalf, according to hospital CEO Dave Flanders. The facility, located in the town of Metter, owes another $1.8 million in additional notes and liabilities. The hospital has been unable to make debt payments to the county, forcing the local government to increase property taxes and borrow money in January and February to cover its own bills. But Flanders and Larry Hadden, who sells insurance in Metter and serves as chairman of the Candler County Hospital Authority, both think the hospital is going to make it. “Will it be easy? Absolutely not. We’ll probably rely on support from the county,” Hadden said. Candler County, population 11,000, has dug deep to keep its second-largest employer afloat. The loss of a rural hospital goes beyond even vital medical care. It represents a loss of identity, a loss of community. “I understand things are changing, but try to have a thriving community without a hospital,” said Carvy Snell, publisher of the Metter Advertiser, a 104-year-old local paper. Metter’s main street is already showing economic cracks. While it looks bustling compared to Glenwood’s, some shops are closed or empty. The county got a financial boost when Linzer Products Corporation opened up a paint manufacturing and distribution center in Metter last year, creating 200 jobs. It would be a lot harder to attract that kind of new business without a hospital, Snell said. Flanders pointed toward cost-cutting measures implemented by the management company ER Hospitals ― including better negotiation on insurance payments and streamlining of administrative services across the company’s health care operations ― as critical to the Candler facility’s survival. The hospital’s robust volume of 130 to 135 surgeries a month and its profitable “swing beds” ― which can be used for patients requiring either acute care or skilled nursing care ― are helping it break even on operating revenue, according to Flanders. But he has no answer for the long-term debt, and if the hospital were to close, Candler County would still be on the hook for the money. “We’ve got to go down swinging,” said Thrift, the county commission chairman. Health care experts point to a variety of reasons for the rapid decline of rural hospitals since 2010. Most rural hospitals were built decades ago and can’t afford upgrades, so they’re losing patients with private insurance ― which often pays better ― to regional hospitals with newer facilities. Doctor shortages are widespread in rural areas, as communities have a hard time recruiting without substantial financial incentives. Meanwhile, financial help from the federal government has decreased in recent years. Due to sequestration, Medicare payments have been reduced. To find the funds to insure more people, the Affordable Care Act cut back a program to reimburse rural hospitals for bad debt. And cuts are coming to the Disproportionate Share Hospital program, which provides extra funding for hospitals that serve higher levels of low-income patients. But many states ― like Georgia ― didn’t expand Medicaid. So rural areas in those states have been hit by the cuts without getting the full coverage boost offered by Obamacare. Expanding Medicaid would have meant greater access to insurance for low-income people and more reimbursement for hospitals, thus helping their bottom lines. But Georgia’s political leadership has refused to expand the program, citing the costs for the state. Still, the future of the Affordable Care Act and its Medicaid expansion is up in the air, with Republicans pushing another repeal bill in the U.S. Senate. With that uncertainty in mind, political leaders in Georgia are in a wait-and-see mode. However, community leaders in Wheeler and Candler counties said there is no doubt that a Medicaid expansion could have helped. “The reality is from a hospital management standpoint, the non-expansion of Medicaid has hurt all rural county hospitals,” said Eaves, the Candler County administrator. It’s inexcusable that Washington is leaving rural hospitals to founder, Morgan argues. A crumpled rug sits outside the closed Lower Oconee Community Hospital in Glenwood. Jimmy Lewis, who heads HomeTown Health, an association of rural hospitals in Georgia, said there’s a magic number when it comes to sustaining a rural hospital without extra government support: a potential patient population of 40,000 people. You need that many people to sustain surgery services, which in turn help keep the hospital profitable, Lewis said. Without a population that large, hospitals need substantial county assistance, a high level of diversification in health services or the backing of a regional hospital system. In Cook County, about 100 miles southwest of Glenwood with a population of just 17,000, another version of this story is playing out. The hospital authority that operates Tift Regional Medical Center, based in nearby Tift County, acquired Cook County’s hospital in July 2012. The Cook Medical Center, located in Adel, is now getting a new facility to replace the one built in the 1940s. Construction is expected to be completed in the summer of 2019. There’s just one catch: The new facility won’t have an emergency room. Cook Medical Center had seen unpaid charges in its ER balloon from $5.6 million in 2012 to $8.5 million in 2016. Hospital CEO Michael Purvis, who started at the facility as an X-ray technician two decades ago, said 95 percent of patients who visited the ER were “non-emergent” ― meaning they could have been treated in a clinical setting. And the ER saw an average of only about 0.4 patients between midnight and 7 a.m. The costs of keeping the emergency room open, combined with general upkeep for the deteriorating building, were unsustainable. The hospital had a net loss of $2.6 million in 2016. So earlier this year, the hospital decided to shut down its ER, steering patients to a nearby community clinic that it operates. Purvis, meanwhile, had pulled together a stakeholders group that included the Cook County commissioners, officials from the city of Adel, the Adel Industrial Development Authority and the Cook County Economic Development Authority to talk through their options. In the spring of this year, they presented the county with a choice: They could build a new facility with convenient care and primary care clinics, a surgical center, a geriatric psychiatric center, an attached nursing home, inpatient and outpatient services, and no ER for about $35 million. Or they could close the hospital all together. “We needed to figure out a new way to serve our rural community, or else you don’t have a viable shot,” Purvis said. Under the plan for a new hospital, Cook County would be on the hook for $5 million, the city of Adel for $4 million, and the Adel Industrial Development Authority and the Cook County Economic Development Authority for $600,000 each. The remaining costs of at least $25 million would be covered by the Hospital Authority of Tift County. When the Cook County Board of Commissioners took up the plan this March, Purvis wasn’t sure what was going to happen. The commissioners had been upfront about their unease with an expensive new building plan, which they feared could require raising taxes and create political blowback. But a no vote meant the hospital would close completely. More than 200 people came to the monthly meeting, which usually attracts only about 10 residents. The community was not going to let the hospital go without a fight. They presented a petition signed by 697 people lobbying to keep it alive. One resident held up a sign that read “No Hospital - Dead City,” according to the Adel News Tribune. The event was also streamed live on the newspaper’s Facebook page, where more than 400 people watched it. The commissioners’ vote was unanimous: The hospital project would go forward. “We felt like as leaders we had to band together to save 250 jobs and the industry in the area,” said Adel Mayor Buddy Duke, one of many who spoke at the meeting. The project aims to save those jobs and create 50 more when it’s completed in the summer of 2019. When asked, Purvis said he didn’t know of any patients who were harmed by the closure of the ER earlier this year. Most of the major trauma cases were already traveling the 30-plus minutes to Tift Regional or a hospital in Valdosta, he said. People in Cook County aren’t particularly excited about losing the ER, but they’re happy there’s still a hospital at all, said Maria Hardman, general manager of the Adel News Tribune. “We didn’t want it shuttered with trees growing up through it,” said Brent Dixon, chairman of the Adel Industrial Development Authority. Telfair Regional Hospital, which closed in 2008, has been overgrown by vines. The McRae, Georgia, facility was about 20 minutes away from Glenwood's hospital. 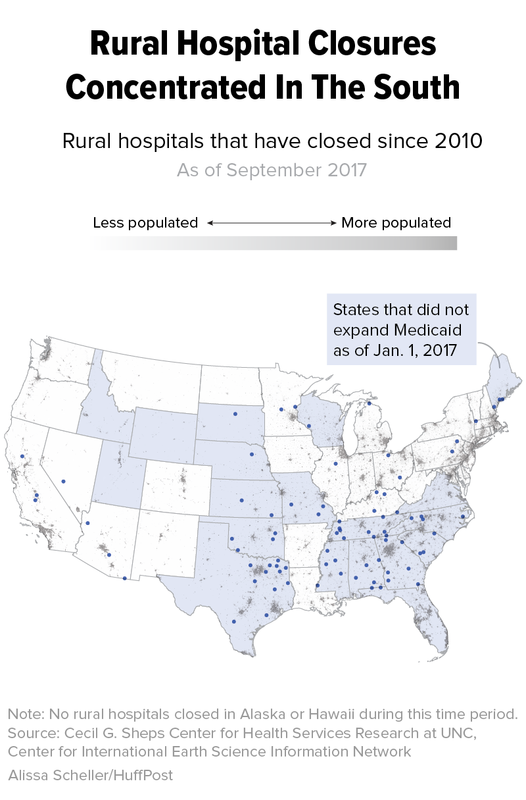 Still, there are nearly 700 other rural hospitals in danger of closing across the country and thus hundreds of rural communities that need to find a solution. Thrift, the Candler County commissioner, acknowledges that the future of rural health care probably lies in prioritizing regionalized medicine with larger, newer facilities that draw patients from several counties ― much like what’s happening in Cook County. “Only way we’re going to survive in rural Georgia is we’ve got to learn where the county line doesn’t end anymore,” he said. Some health care experts say the rural future lies in standalone emergency rooms, perhaps with a few beds on standby for follow-up care. Shifting people with less urgent conditions to convenient care clinics, instead of relying on expensive ER visits, can cut down costs. Telemedicine will serve some needs, although broadband service in Georgia’s rural areas has a long way to go. The total number of full-fledged hospital beds should also be reduced, some experts say. And some community hospitals may survive by investing in new facilities and equipment to better compete for patients and cut down on maintenance costs. One way or another, the size and scope of care at many rural hospitals has to be reduced to beat the bottom line pressures. Infographics created by HuffPost’s Alissa Scheller. Weathered parking signs posted outside the shuttered Lower Oconee Community Hospital in Glenwood.